Actually, bidding is more like simple arithmetic than magic. But when it is done well, it works like magic. The basics of bidding involve having an accurate agreement with your partner about what your bids mean. These agreements have evolved over the decades. When I first learned to bid, I used the methods promoted by Charles Goren in a massive tome of a book. I read this book over one New Year’s Eve when I was sick in bed with a bad case of the flu while my boyfriend was out cavorting at a party. Not fun (the flu and missing the party that is). The methods now are different than what I learned then, and perhaps what you first learned. Correct bidding is essential to evaluate your team’s hands properly. It is the sole means by which you communicate with your partner. Grunts and negative facial expressions are not acceptable, as is clutching your chest to say you like Hearts or twirling your wedding ring to show a preference for Diamonds. Bridge is not a game in which you play only by yourself. You have a partner. If you communicate accurately with your partner, one of you will limit your hand. If your bidding tells your partner that you have 12 to 14 points and a five-card major suit, or whatever your agreement is with each other, you will have limited your hand. Your partner then is capable of assessing the potential of your two hands within about three points. He does this by the simple method of adding his points to the approximate value of your hand. He will then know whether the partnership likely is heading towards a part-score contract, a game contract or a small or even a grand slam. Tres simplement. Goren and others, including Canadian Bill Anderson implemented and/or promoted the point-count system. Can you imagine staring at your new hand without such a system in place to guide you when you are trying to decide on the best bid. In most cases, it would be a blind guess. The system, still used presently, assigns a point-value to each of the honour cards. Aces are assigned a value of four points, Kings are given three, Queens are given two and Jacks are given one. Many of the people who worked on inventing this system were actuaries who were experienced in working with statistics. Actually, the accurate figures they calculated didn’t come out in nice round numbers. The promoters realized, however, that it would be too difficult for players to add up numbers involving decimal points. For convenience, they rounded the numbers off to 4,3,2,1. It worked out that statistically, Aces were worth more than the four points assigned to them, Kings were still worth about three points and the lower-ranking Queens and Jacks were not worth as much as the two points and one point given to them. The distribution points for long suits and short suits have changed. When I started learning Bridge, I was told that when I was first calculating the value of my opening hand, I should include three points for a void, two points for a singleton and one point for a doubleton. The problem with this method was that your void or singleton may be in your partner’s best suit. In that case, shortness was a liability and not an asset. In modern Bridge, players do not count shortness initially, but only later in the bidding, after the two partners have discovered that they have a fit. Be aware that you should be re-evaluating your hand as the bidding progresses. Its value may go up or it may go down depending on what players bid. You now count length, but not shortness, when first evaluating your hand for opening. Esteemed Canadian teacher, Barbara Seagram often mentions in her writings that length points are included in calculating the strength of your hand. 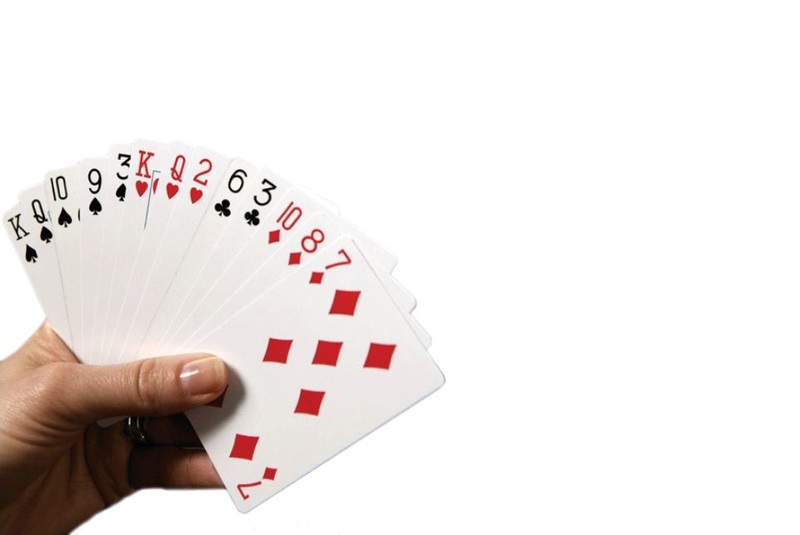 One point is added for each card beyond four in a suit. Shortness is not included when making the first evaluation. Next week we’ll discuss the important concept, in more depth, of limiting your hand. If you wish to promote an activity in your bridge group or ask a bridge question, send the information to [email protected] and I will try to include it in this column. Games are at the Active Living Centre, Thursdays at 7 p.m. in the multi-purpose room 2nd floor (elevator) (back entrance of Canada Summit Centre). Just come – with or without a partner. For now, this game will be played following Chicago Rules (allowing both fast and slow games). You will keep your same partner for the entire evening. Cost is $1.50 per person. Parking is outside the North Entrance opposite Heritage Village Railway Station. Games for the Port Carling Social Bridge Club are Monday afternoon 1pm at the Port Carling Community Centre, 3 Bailey Street. Please arrive with your partner at least 10 minutes before game time. Games for the Huntsville Club are Tuesday evening 7:00, Trinity United Church 33 Main Street. Please arrive at least 15 minutes early. Contact Jan Roberts 705-635-2522 or [email protected] for information and partnerships. Games for the Bracebridge Club are Mondays 7pm, Knox Presbyterian Church, 120 Taylor Road. Please arrive 15 minutes before game time. Looking for more bridge tips? You’ll find them here.